Built within a valley surrounded by naturally-formed karst hills in China's remote and mountainous southwestern Guizhou province, the FAST radio telescope's huge dish is equal in size to 30 football pitches and was constructed from 4,000 individual metal panels at a cost of around $180m. Chinese state media have enthusiastically focused on FAST's huge size, noting that it dwarfs by 200 metres the Arecibo Observatory in Puerto Rico, which at 305 meters in diameter had been the world's largest single-aperture telescope since the 1960s until the Chinese telescope was completed in July. Kanigits stand ready to shrub it! What the hell we shrub anything! Agreed. The Chinese may not, though.. if I remember my rumors correctly, the Chinese take extraterrestrials very seriously. UFO clubs are right out, and the government sponsors a tight research team out of the Purple Mtn. Observatory, staffed by invitation only. If anything, they're building insane supercomputers over there nowadays, maybe they'll need the dish data as fuel. China’s science and technology ambitions are immense. With the government dedicated to making its investment comprise 2.5 per cent of GDP by 2020, some of the world’s biggest experiments are either under way or proposed. Like the largest radio telescope which began receiving signals this week, to missions to outer space and the ocean depths to medical breakthroughs and a proposal for a massive supercollider, no research would seem too daunting. But these are symbolic, headline-grabbing projects with equally impressive budgets and they are more often than not launched without public discussion or sufficient debate. If the nation is to truly become a scientific powerhouse, authorities have to also be mindful of transparency, ethics, collaboration and ensuring spending gets to less glamorous, although just as worthy, endeavours. A shift to abstract science from a practical approach with more immediate returns shows the desire for innovation and creativity. But as welcome as the investment in science and technology is, symbolism and prestige cannot be allowed to get in the way of enabling a wide range of research. Transparency will ensure open debate of ideas, guaranteeing funds are directed to work that benefits not just Chinese, but all humanity. Thanks for the link - it also gave me a chance to look up the specs on their new telescope, too. Niice.. 70-3000 mhz! Politics is almost guaranteed to rear its ugly head, with all the fuss in the South Seas the Chinese are not in a happy mood. I hope that sharing data can shown to be a force for good, a sign that no matter what happens, science transcends petty sovereign squabbles. That's the hope, anyway. We'll have to see - they're tuning the panels right now, and since it's all very new it will take a year or two of seasonal cycles for everything to settle in. The real data should be arriving this time next year, apparently.. There's a few projects from the Chinese Academy of Sciences running out there, do you think they'll get involved? Any history with them? CAS@home at [url] http://casathome.ihep.ac.cn/ [/url] is the only Chinese project I know of. That's the only one I've found, too.. now that I've taken a closer look, it seems the only running app is their protein folder (falcon-treefinder now called ict? ), with 15k users. I thought they would have more applications given the list of academy members. They do have a Chinese national team website linked off the CAS page, with links to WCG, Atlas, and all the favorites, but nothing else based in China itself. Hm. I wonder why they're so cautious about vol. dist. computing? It's not traffic, there really isn't any. Security? 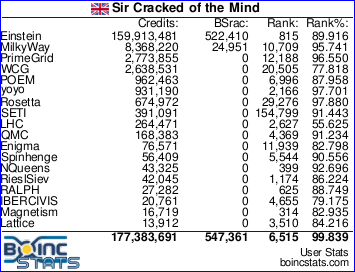 If there was any security problem with the boinc package we would have definitely heard the roar by now. There's no practical limits, leaeving culture and politics. Scientific culture is defintely pro-boinc, the Chinese public, too. Bureaucracies and Governments (note caps) have a tendency to "say no, then negotiate".. maybe that's what we're seeing..